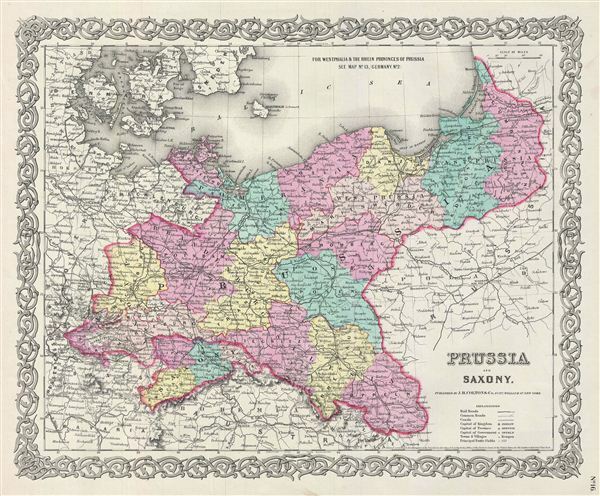 A beautiful 1855 first edition example of Colton's map of Prussia and Saxony. Like most of Colton's europe maps, this map was derived from an earlier wall map of the world produced by Colton and D. Griffing Johnson. The map covers what is today northwestern Germany. Prussia attained its greatest importance in the 18th and 19th centuries when it dominated northern Germany politically, economically, and in population. The German Confederation, created in 1814, acted as a buffer zone between Austria and Prussia, its two largest and most powerful member states. Nonetheless the rivalry between the two powerful states increased until the break out of the Austro-Prussian War. Prussia won the Austro-Prussian War in 1866 which ultimately led to the collapse of the German Confederation. A few years later, in 1871, most of the former Confederation states were folded into the newly proclaimed German empire. This map also identifies various cities, towns, villages, railroads, canals, rivers, rapids, mountain passes, and an assortment of additional topographical details. It also identifies battlefields, including the 1757 Berlin raid which took place in the capital of Prussia during the Seven Years' War. Map is hand colored in pink, green, yellow and blue pastels to define national and regional boundaries. Surrounded by Colton's typical spiral motif border. Dated and copyrighted to J. H. Colton, 1855. Published from Colton's 172 William Street Office in New York City. Issued as page no. 16 in volume 2 of Colton's 1856 Atlas of the World. Rumsey 0149.083 (1856 edition). Phillips (Atlases) 816.